Yoga classes at Dunhill Multi-Education Centre start on February 18th at 7.30pm with The Mystic Holistic. We will practice mindful breathing, movement & meditations to bring the body, mind and energy back into alignment. Growing stronger on all levels! Initial 5 week term €60 for 5 week term. €15 drop in. 15% discount for jobseekers and students. Lectures are held at Dunhill Multi-Education Centre (opposite the GAA grounds). Starting at 8 p.m., each lecture lasts about an hour and is followed by a question & answer session and light refreshments. Full line up of lectures available here. Following the success of our Saturday Supervised Study programme for the 2017/2018 academic year, DMEC is delighted to announce its 2018/2019 start date! 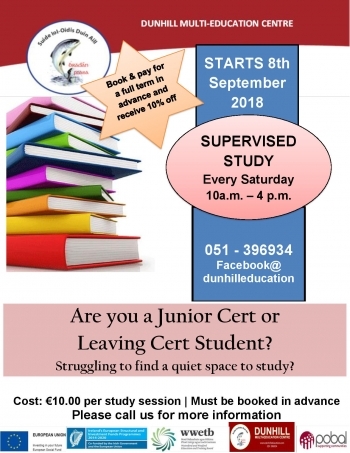 Saturday supervised study will commence on Saturday, 8th September at 10am and will continue on a weekly basis throughout the academic year, at a cost of €10 per session. The centre offers students a safe, warm, spacious, and comfortable study environment conducive to learning, where misbehaviour or distractions of any kind are not tolerated. Students are regularly reminded of the importance of respecting the study efforts of other students, and making the most effective use of their time. Tea and coffee is provided free of charge and drinks and snacks are available to purchase. It is recommended however that students bring their own lunch. Deposits now being taken, so please call our office today on 051 396934 for more information. Application Form can be downloaded by clicking here. Rules and Regulations of Supervised Study can be downloaded by clicking here. To access these files, an application like Adobe Reader or Foxit Reader is required. The series will run for ten weeks, every *Thursday from 10 January to 14 March, starting at 8pm. 28 Feb Donnchadh Ó Ceallacháin: Joseph Fisher, the Munster Express and the Land League in Waterford. Starting at 8 p.m., each lecture lasts about an hour and is followed by a question & answer session and light refreshments provided by Park Café. All are welcome. There will be an admission charge of €5 per lecture, with a reduced price of €45 for the full series of ten lectures. UNEMPLOYED AND LOOKING FOR TRAINING? Great news for anyone looking for a career in tourism, outdoor recreation or trail development. 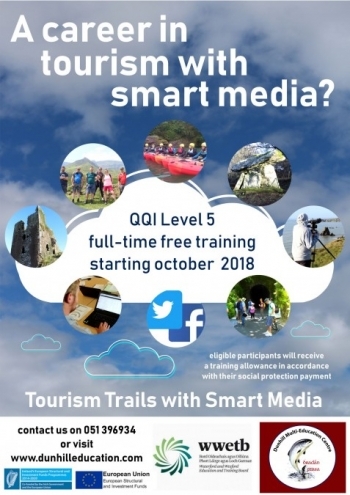 The newly designed Tourism Trails With Smart Media will develop skills in digital technology, tourism and trail building. We are now enrolling for the 4 day QQI Level 6 component award Training Needs Identification & Design 6N3325 course. The course will run on February 1st , 8th,22nd & March 1st . Start your “Train the Trainer” journey with this course which will equip you with the necessary tools to identify training and development needs, devise training plans and explore training and development design. Furthermore, for those of you who completed E30179 Train the Trainer or 6N3326 Training Delivery & Evaluation in the last 5 years, you can achieve the 30 Credit QQI Level 6 Special Purpose award in Training & Development. 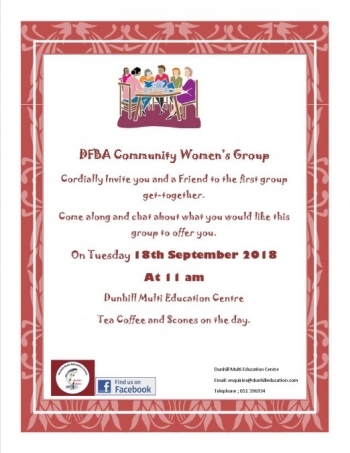 The DFBA Community Women's Group is hosting it's first meeting at Dunhill Multi-Education Centre. Help and shape this group, make it your own: call in to our meeting, participate and make your voice heard. NO FEES and participants may be eligible to a weekly training, travel and meal allowance as well as childcare under the CETS Scheme. Park Café is now open in Dunhill Multi-Education Centre. Serving freshly brewed coffee along with a selection of hot & cold beverages Monday to Friday from 9am to 3pm. Fresh scones are baked on site every morning and the Café serves a selection of sandwiches and soups for lunch. Come along and see a range of food produced in Dunhill Ecopark available to sale. We are now taking orders for Christmas hampers, available for all budgets. Pick a selection of locally made foods such as jams, chutneys, sauces & relishes or allow us to put together a hamper within your budget.